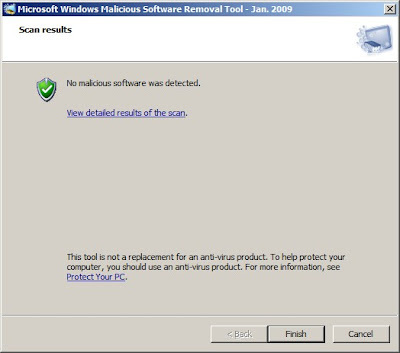 Turns out that after a week of fighting the Conflicker worm, the Microsoft Malicious Software Removal Tool was the one that actually cleaned out the worm. Microsoft has more information about the worm and an KB article specifically about this worm. Looks like I wasn't the only one having problems. F-Secure's weblog also has an article about the strange AUTORUN.INF I found on my boss's computer not long after we started having problems on the LAN. I suspect that during the New Year holidays, one of the managers took a company notebook home and got infected, and brought destruction back to the company. Fun! Update: I don't feel so bad now since I'm only 1 in 3.5 million infected.